At Ashbrook Roofing, we supply an exceptional selection of roofing materials for building projects of all sizes. Though lead is one of the most popular roofing solutions, favoured for its durability and longevity, certain situations often call for a suitable substitute. 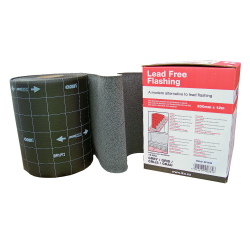 Lead Flashing Alternatives are an effective solution when traditional lead isn’t viable. It’s lighter, safer to handle and has little scrap value, thus reducing the risk of theft. Despite the benefits, it can be used in place of lead in most instances, including chimneys, roof lights and solar panel fixings. If you’re looking for more alternatives to lead flashing, take a look at our selection of roof slates. We’re a team of experienced roofers with more than 30 years’ experience in the industry and we’re on hand to offer free and impartial advice to help you with your roofing project. Contact us today. Place your order for lead flashing alternatives by 2pm and receive your order the very next day.